SKU: stnichsts001 SKU: stnichsts001 Categories: Authentic Antique Icons, Icons of the Saints, N, Other Iconographer. Tag: Nicholas the Wonderworker of Myra in Lycia. 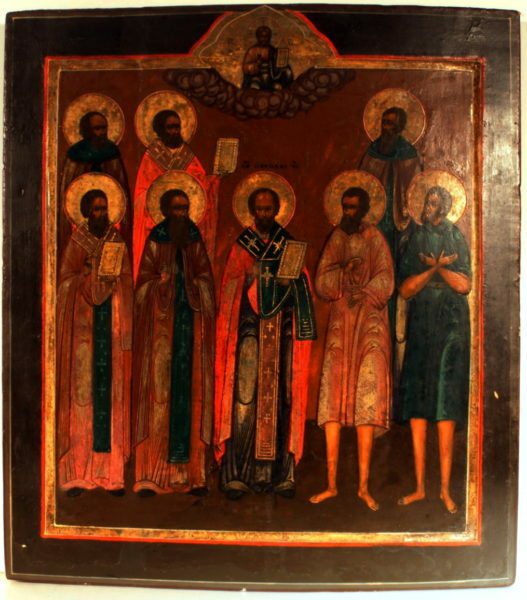 St. Nicholas with seven additional saints – Early 19th / late 18th century icon on panel with double splines on reverse. Egg tempera over gesso grounds with kovcheg. Quality icon in very good condition. Russian. Size: 14″ x 18″ x 1.1″.